Beep boop boop boop boop boop boop boop beep. Hello? Yes, this is Mark Wilson...calling from my phone. 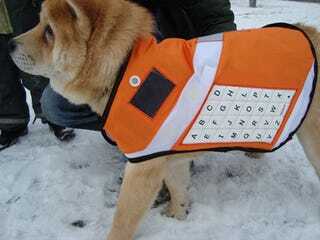 My dog phone. Yeah, some fireman Gray Powell'd it after an earthquake or something, but when I saw the little pooch, licking a dismembered arm sticking out from the gravel, I thought, that little puppy could use a friend! So I shoved him in my manbag (tossing the iPhone and the worn-out teacup bulldog), fed him a milk bone stuffed with a SIM card and, yeah, here I find myself now, owner of what's probably the chicest phone on the freaking planet. Does the iPad Make Man Purses Okay Now? Sent from my Dog Phone.